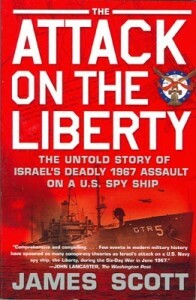 “The ATTACK On The LIBERTY” The Untold Story of Israel’s Deadly 1967 Assault On A U.S. Spy Ship. By James Scott. On June 8, 1967, as war raged between Israel and its neighbors, an American spy ship, the USS Liberty (AGTR-5), eavesdropped on communications off the coast of Egypt. When Israeli fighter jets flew overhead, the Liberty’s crew assumed that the ship’s identifying markings and American flag would be visible to the pilots in the clear skies above. After several passes over a period of hours, the jets suddenly opened fire and began strafing and napalming the deck of the Liberty, which had minimal defenses. When the air attack ended, Israeli torpedo boats appeared and scored a direct hit. By the time the assault was over, 34 American crewmen had been killed and 171-two-thirds of the crew, seriously injured. Only heroic efforts by the crew saved the ship from sinking. Back in Washington, news of the attack on the Liberty was received with a mixture of shock and outrage. Many in the Pentagon and in Congress demanded that Israel be held accountable for the unprovoked attack in international waters. The Johnson administration initially responded by threatening Israel but soon softened its attitude. Israel’s stunning victory in the Six-Day War, as it became known, was a source of pride to many American Jews, and their support was crucial to an administration mired in an increasingly unpopular war in Vietnam. With the death toll mounting daily in Vietnam, the attack on the Liberty was pushed to the back pages of the nation’s newspapers and ultimately all but forgotten. James Scott is a journalist and the son of a surviving Liberty officer. In this riveting book, he recounts the story of the horrifying attack and the tremendous impact it had on the lives of the crew. He puts the attack in context, showing how political considerations trumped the demands for justice from the survivors and their supporters in the military and in Congress. Drawing on new interviews and recently declassified documents, he demonstrates that Israel’s initial insistence that the attack was a mistake caused by misidentification of the ship is implausible. Scott documents, for the first time, the fact that the ship was correctly identified by at least one of the pilots prior to the attacks. His descriptions of the crew under fire and their frantic work to save the ship are dramatic and unforgettable. Scott takes readers into the conference rooms at the White House where the most senior officials in the government debated how to respond to the attack and then eventually devised a plan to protect Israel from public outrage. The Attack on the Liberty is the finest account yet of this tragedy and a remarkable tale of men under fire in an incident that remains bitterly disputed after more than forty years. New Softbound edition. 374 pages with 22 black and white photographs and an index. No maps.